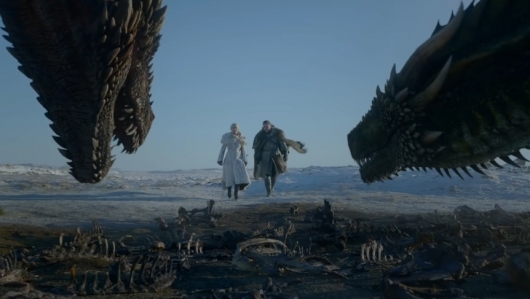 In the 18-minute featurette, released on the Game Of Thrones YouTube page, we learn what it takes to create the settings, make riding on dragons look real, reunions between the cast and crew, and so much more. Basically, it looks at the production side of things. So don’t expect to see any real big spoilers. That is, unless you haven’t watched the episode yet. This probably won’t be the last kind of behind-the-scenes featurette you’ll be seeing for the series. As there are only 5 episodes left, HBO is going to give us as many looks at the show, whether it’s an episode or a behind-the-scenes look, as possible. Because this will be our last chance to see the fight for the throne. At least until the spinoffs and prequels start to appear. Created by David Benioff and D.B. Weiss, Game Of Thrones stars Kit Harington, Peter Dinklage, Nikolaj Coster-Waldau, Lena Headey, Emilia Clarke, Sophie Turner, and Maisie Williams. The next episode premieres exclusively on HBO on Sunday, April 21, 2019.